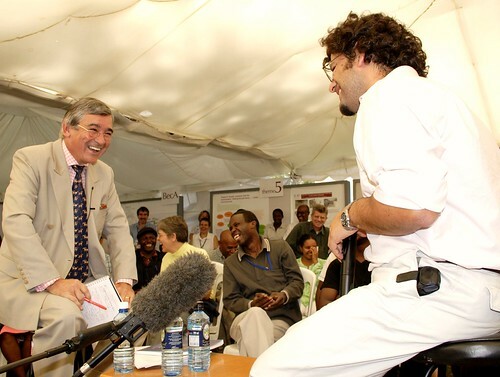 Brian Perry (left) interviews Mario Herrero in a ‘hard talk’ series at ILRI’s annual program meeting in 2006 in Nairobi (photo credit: ILRI). Here, for your pleasure, are collected all the short filmed Hard Talk interviews conducted by Perry at ILRI’s annual meetings. Tags: APM2006, Appolinaire Djikeng, Azage Tegegne, Bernard Bett, Brian Perry, Brigitte Laude, Carlos Sere, Delia Grace, Ed Rege, Edwin Perez, Gabrielle Persley, GALVmed, Hank Fitzhugh, Iheanacho Okike, Jeff Mariner, Jimmy Smith, John McDermott, Lucy Lapar, Mario Herrero, Peter Jeffries, Robin Reid, Sarah Jackson, Segenet Kelemu, Sibonisio Moyo, Vish Nene. Bookmark the permalink.